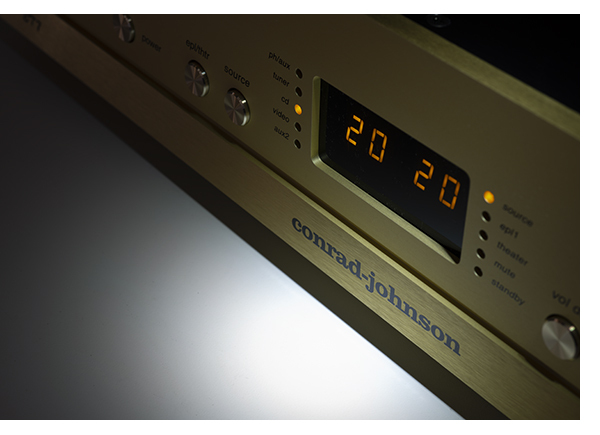 The conrad-johnson team knows tube preamplifiers, with over 40 years of experience under their belts, building coveted products which improve with each new generation. The ET7-S2 we review here is c-j’s middle child preamplifier, sandwiched between the GAT series 2reference and their entry-level ET3. For $12,000 the ET7-S2 benefits from many sonic improvements implemented in C-J’s flagship, but at a more accessible price point. Like all c-j products, this preamp comes with only one faceplate color. Gold. And don’t even try to convince them otherwise. The ET7 features a hefty build weighing in at 19 pounds (8.62 kg), and audio rack-friendly dimensions of 19 inches (48.3cm) wide by 15.375 inches (39cm) deep by 4.375 inches (11cm) tall. 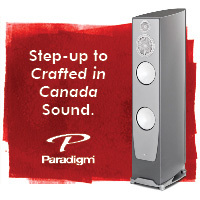 The ET7 comes with a matching, beautifully anodized remote allowing a user to change volume or source, mute, and alter left-to-right balance from the comfort of a listening seat. 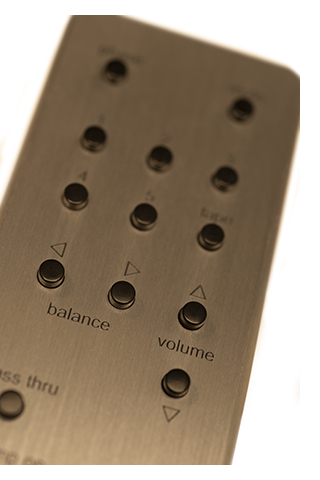 The front panel offers the same functionality, with delicate silver buttons and yellow LEDs to indicate user selections. 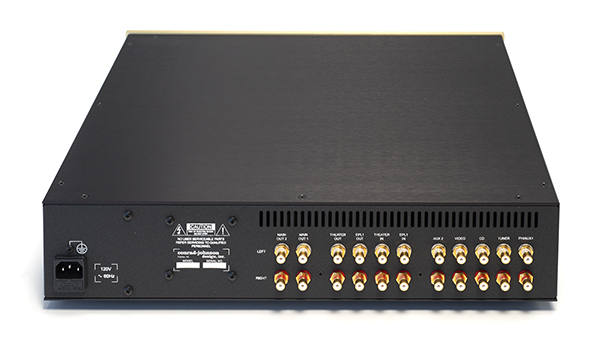 This preamp’s face features an LED screen showcasing the volume level for each channel. When the numbers are identical, balance is centered. As balance changes, the two numbers diverge from one another. 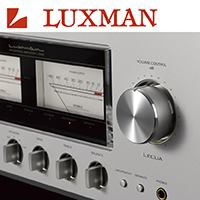 When changing volume using the remote or the buttons on the front panel, the ET7 has a very audible click accentuating each volume step activated in the digital domain. If you are used to a component with a smooth, silent volume change this sound is a bit jarring. After a few days though, it becomes second nature. Those who enjoy tube rolling can open the chassis and make the swap. Some tube gear gets quite hot during use, but the ET7 case does not, even when left on for a few days. The ET7 features a standby mode to keep circuitry warm, but not waste tube life when the preamp is not in use. Depressing the power button toggles the component on or off. After powering on, the mute button engages while the tube warms up for a minute. When the mute shuts off automatically, you are ready to rock. 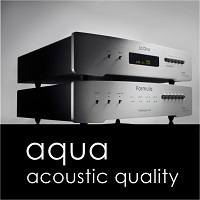 The preamp features a single-ended topology and offers only RCA connectors. The user has a choice of five sets of pre-labeled inputs, plus two sets of “main outs.” The extra outputs prove especially handy for connecting subwoofers should the owner choose to add them. The ET7 does not include a phonostage, but c-j does label one set of inputs for one if the owner wants to connect an external component there to avoid confusion. The ET7’s ability to handle home theater pass-through is a welcome feature. While I don’t use any surround sound components in my listening space, I do enjoy the ability to use the preamp’s pass-through capability with a Sonos system. Interconnecting the ET7’s home theater outputs to a Sonos Connect’s inputs, I can extend sound to the rest of the residence with Sonos speakers playing the music from the main rig. The preamp includes c-j’s proprietary CJD Teflon capacitors, refined over the last decade. However, they do take some time to break in fully. We gave the ET7 200 hours of operation before making any serious judgments, although it sounds mighty good right out of the box. You will not be disappointed. Its overall character is on the warmer side of neutral, but not mushy or overly-lush. The ET7’s bass portrayal renders low frequencies naturally, with the heft or sustain engineered into the recording. The preamp’s high frequency process offers a lot of detail too. It renders the harmonically-complex, but the beautifulring from percussive elements like a triangle or cymbal with grace. It also brings a palpable life to soprano vocals and reveals the subtle sonic cues which contribute to the ET7 soundstaging prowess. There’s a very organic quality about this preamp. 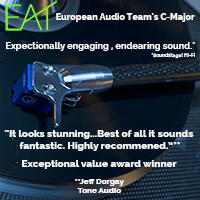 The ET7 takes the sting out of edgy recordings, yet still manages to reveal the fine details within. The resulting sonic signature is akin to taking a seat in the tenth row of a concert hall rather than the first. Soundstaging is equally impressive. 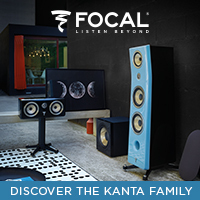 Musical elements extend in all directions around the speakers but never bunch up around them. The ET7 also does a very good job placing musical elements front-to-back in the soundstage. Vocals reach forward into the room, even when the sound engineer places multiple instruments – like percussion – in the center of the musical picture too. 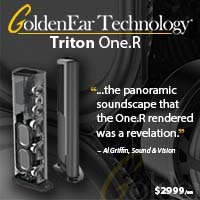 After enjoying all genres with the ET7 in the chain, there is little to criticize and a lot to love. Is it right for you? That answer lies with your preferred sonic signature and the gear you want to pair with it. Those who crave accentuation of every note and detail in a song may find the c-j’s smooth presentation a tad polite. A very punchy solid-state amp might be a good match in that case. Those who want to grab a seat on the sofa and dissolve into the bigger musical picture, though, better buckle in for a long listening session and forget about analyzing the music. 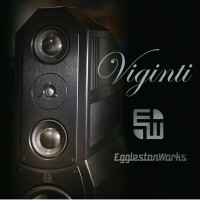 The ET7’s highly engaging sound is beguiling, and a perfect match for my ART150 power amplifier. The ET7 series 2 linestage preamp represents an excellent option for those who seek fantastic musical performance. At $12,000 the ET7-S2 represents an investment. However, if you prioritize music in your life start saving your pennies now. Considering the amount of trickle-down technology which the ET7 gains from the GAT design, it can approach flagship performance at half the price. After several weeks with the ET7 in place, it certainly proved its mettle. Its natural, organic presentation is immersive. Plus, the ET7’s warmer character will help it pair well with most amplifiers – and music — of your choosing. 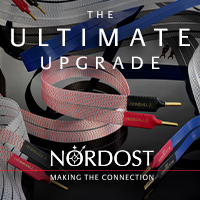 Yes, there will always be new components that come to market, but newer is not always better. I expect c-j has some tricks up its sleeve for future products to debut as they approach their 50thanniversary in a decade. But for now, the ET7-S2 represents a marvelous achievement, coupled with a three-year warranty backing it in the unlikely event it should fail. 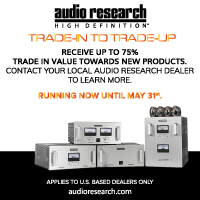 If you seek a preamplifier in the $10,000 range, be sure to put the ET7-S2 on your short list for an audition. You will not be disappointed. 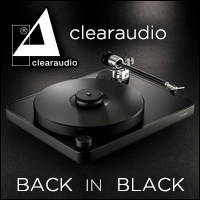 Their original amplifiers and preamplifiers back from the late 70s to the mid 90s had a sound that was tonally rich and saturated, though criticized by some to be a bit warm and vintage in presentation. Yet the c-j motto “it just sounds right,” won them a legion of loyal fans the world over. Much as a fancy adjective might impress you, that tagline was always the essence of their sound. When the CJD Teflon caps were first implemented in the early 2000s, it sparked the era of what I’d call the “modern c-j sound.” None of the midrange magic and tonal purity that I’d always loved with c-j components was lost, but c-j components now had an entirely new level of bass extension, dynamic range and lower noise floor. This began with the ACT2 and ACT2/series 2 preamplifiers, which were my main reference components for many years, then moving on to the GAT and GAT 2. All four of these preamplifiers have received an incredible amount of awards the world over, and many end users as well as audio reviewers have called them the best in the world – for good reason. There’s still something unmistakable about the c-j experience. 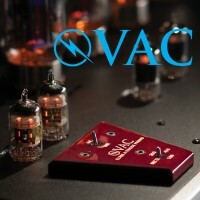 Few preamplifiers have this level of refinement with no shortcoming. Full circle, “it just sounds right” is as salient in 2019 as it was in 1979. That’s impressive. Running the ET7 through its paces here, with a wide range of power amplifiers from c-j and others. Though the ET7 uses single ended outputs, it (like the others before it) has no problem driving a 30- foot pair of interconnects to a pair of power amplifiers on the other side of the listening room. Comparing the sound through the 30-foot pair of Cardas Clear interconnects and a 3-foot pair revealed no difference. The design team at c-j has always taken a less is more approach and it has always worked well. Where there is still a substantial enough difference in sheer scale and resolution to more than justify stepping up to the mighty GAT 2, provided you have the system and can justify the expense, a quick comparison to an ACT 2 shows just how much the design team has learned. Granted some of this could be the difference inherent in the 6H30 triodes used in the ACT 2 versus the single 6922 in the ET7, but the current preamplifier has more refinement, much more. If this makes sense, the ACT 2 sounds a bit brutal now by comparison. It’s like the difference between the power delivery of a late 90s air-cooled Porsche 911 and the current car: the older car had more urge, which grabs you at first, but the new car has a much wider power band and modulation of power that it’s more useful every day. Considering that 15 years ago, the ACT2 was a killer preamplifier at $13,500, the ET7 is an exceptional value at $12,000 today. Hence, the ET7 gets one of our first awards of 2019, and well deserved. 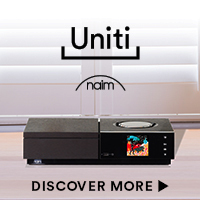 This certainly can be a destination preamplifier for 99% of our listeners. It still sounds right.